As we’ve discussed before and will no doubt talk more about in the future, as a direct result of her position as sovereign of the United Kingdom and the Commonwealth, the Queen has a large array of powers at her disposal entirely unique to her. Of these powers is the ability to knight a person she feels is particularly worthy of such an honor. But this brings up the question- what do you actually get for being knighted, both today and historically? To begin with, it’s important to first understand that there are several so-called “Orders of Knighthood” the Queen can appoint a person to, with what exactly a person did to earn the honor and what their job is usually being taken into account to decide which. For example, the Queen usually appoints members of the Military or Civil Service to the Order of Bath, while people who perform valuable work in regards to foreign relations will (usually) be appointed to the The Order of St Michael and St George. By far the most well known order though is the seemingly Bill and Ted named “Most Excellent Order of the British Empire,” often shortened simply to The Order of the British Empire, which has no specific criteria for appointment and is generally the order members of the public will be appointed to. That said, the Queen is under no obligation to appoint individuals to any specific order and as “The Fount of Honour”, she is considered the ultimate authority in these matters. However, there is only one honor noted to be given entirely at “the Queen’s own will” – The Royal Victorian Order – with all other appointments typically being made at the suggestion of specific government officials or Royal advisers (though, as mentioned, the Queen can ignore any such suggestions at her own discretion because, well, she is the Queen). In addition, members of the public can nominate anyone they feel is deserving of a knighthood or specific honor by contacting the relevant authority and providing a detailed account of that person’s individual achievements. For the curious, it is not possible to nominate yourself for a knighthood, though services exist that will petition for one on your behalf, for a fee. On that subject, it’s here that we at TodayIFoundOut would like to note that neither Simon Whistler, our famed British YouTube host, nor the co-author of this script, the just as British but with a much less posh accent Karl Smallwood of Fact Fiend fame has yet been knighted, despite for years tirelessly working to get the masses interested in learning stuff, which is good for society in general, right? Again, apparently the Queen takes suggestions from the general public… Just saying… Any knighting ceremony involving Karl Smallwood is almost guaranteed to be hilarious if nothing else. In any event, for the most part every Order of Knighthood has several “grades” roughly comparable to military rankings with higher grades being considered more prestigious in nature- the exceptions to this being the Order of the Garter and The Order of the Thistle, both of which have only a single grade, Knight or Lady depending on the gender of the person being given the award. It should also be noted that some grades, such as being a Companion in the Order of Bath, do not allow the individual to use such accolades as Sir or Dame. Then there’s the honor Knight Bachelor (which is basically a knighthood where the person isn’t admitted to any specific Order mentioned previously) which has a single grade, Knight. As you may have surmised from that, this one is only bestowed upon men. This all brings us around to pretty much the only real, tangible benefit conferred upon people given such an honor- a title. You see, anyone outside of clergy members who the Queen bestows the grade of Knight or Dame in any of the aforementioned Orders can, if they so wish, use the title Sir or Dame (or, again, in the case of The Order of the Garter or Thistle, Lady) in their day-to-dealings. Individuals named a commander, member, companion or Lieutenant of a specific order meanwhile may instead add the letters signifying this, for example, OBE (signifying the individual is an Officer of The Order of the British Empire) or CMG (signifying the individual is an Companion of The Order of St Michael and St George), to the end of their name. On that note, with the exception of a title, all of the other benefits conferred by a knighthood are intangible in nature to the point that even a site dedicated to helping people receive such an award noted that the main benefit is simply “a raised profile”. Given, however, that a decent percentage of those knighted already have fairly high profiles, this is of little benefit to those individuals. Be expected to have the financial ability to support the honour of knighthood, so that he could provide himself with arms, armour, horses and the required number of armed followers to render military service to his Sovereign for a minimum period each year. That said, one historical advantage to being a knight was that if you were captured in battle, you’d in all likelihood be setup in relatively nice accommodations and then ransomed, rather than potentially slaughtered as common-folk. Although, if it was obvious you had a good deal of money or powerful connections, it didn’t really matter if you were a knight or not, this catch and release ransom system was pretty much par for the course for the affluent. It’s also worthy of explicitly mentioning that historically the title of Knight was seen as being so exclusive that nobody, not even a King, could be born a Knight. To maintain the exclusivity of the position, and no doubt because of the political benefits of the change, King Henry VIII made the ability to confer the title of Knight upon a person something he and only he could do. The same holds true today, though the Queen can grant someone permission to bestow a knighthood in her stead if she so wishes. Previous to this monarch privilege, anyone of sufficient rank, such as a Royal commander of the army, could knight a person they deemed worthy. As for the act of knighting itself, while historically it might include ritualistic bathing and things of this nature, today it usually consists of a simple ceremony where a medal signifying rank is placed upon the awardee’s chest by either the Queen or a designated member of the Royal family. To facilitate this and make everything go as smoothly as possible, prior to the award ceremony each recipient will be given a small pin to attach to their clothes from which the medal will be hung and the medals themselves will be laid out by a Royal assistant on a fancy cushion in Buckingham Palace. As per tradition, those becoming a Knight or Dame will also be lightly tapped on each shoulder with the sword (first on the right and then on the left), after which they are given said medal or badge. Those of lower ranks in the orders not allowed to use the accolade Sir or Dame only get the medal, no sword tapping. As an event steeped in tradition, every aspect of the knighting process has a symbolic meaning and the items associated with it are considered national treasures. For example, the stool people being knighted kneel on, known unsurprisingly as the Knighting Stool- not to be confused with the stool a knight might produce on the toilet afterwards- is over a hundred years old and immaculately maintained to ensure it remains in good condition. The sword used by the Queen is similarly steeped in tradition, originally being used by her father, George VI, when he served as Colonel of the Scots Guards. This sword is the Queen’s personal weapon and any member of the Royal family knighting a person in her stead has to use their own. One thing we’d also like to point out is that an aspect of ancient knighting processes that has sadly been lost to history is a slap. You see, at one point before being knighted a person would be expected to stand there as the person knighting them slapped them across the face. Sources vary on what exactly this was supposed to signify, but the general hypothesis is that it was more or less a show of dominance by the person administering the slap- being the only person a knight would take such a blow unanswered from- and of fealty by the person being knighted. But whatever the case- to sum up, being knighted by the Queen disappointingly does not come with a fiefdom and peasants to work the land, nor any such tangible award- not even a badass custom forged sword, though we know of at least one case where an individual knighted, British author Sir Terry Pratchett, went ahead and had such a sword made and then lamented the laws of the land didn’t allow him to carry it around in his day to day life, despite him officially BEING a knight. Really, all you get is a title and a bit of added notoriety potentially providing some small intangible benefits like allowing you to get a table right away at a fancy restaurant when all the commoners have to wait in line. Why Doesn’t the Queen of England Need a Passport? 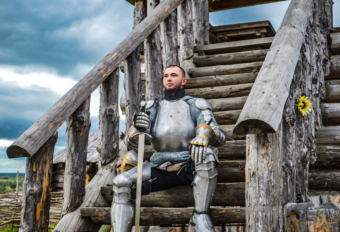 Although considered by many to be a great honor, knighthoods have been turned down in the past with some sources claiming around 2% of the roughly 3000 people singled out for a knighthood rejecting the honor. Notable people to do this include comedian John Cleese (who famously said he was more honored having a lemur, Avahi cleesei, named after him) and David Bowie who reportedly turned down a knighthood twice. Generally the reasons for turning down a knighthood aren’t made public and we only really know about any of them because of a Freedom of Information request filed by the BBC a few years ago. A knighthood can be revoked or annulled at the Queen’s discretion if the person in question does something decidedly dishonourable and unbecoming of a knight. A notable example of this being Anthony Blunt, who served as the Queen’s art advisor until it was revealed he was actually a Soviet spy. Ed Sheeran was injured by Princess Beatrice after she attempted to jokingly “knight” him with a sword at the behest of singer James Blunt at a party. Apparently the Princess does this all the time for party goers with her father, Prince Andrew’s, ceremonial sword, though Ed Sheeran is the first person she’s injured doing so. Nope. In fact, a number of people have turned down the honor due to uneasiness with its militaristic or imperialist overtones. According to an AP story, approximately two percent of theor so people offered spots in the Order each year decline them.